More power for the office. 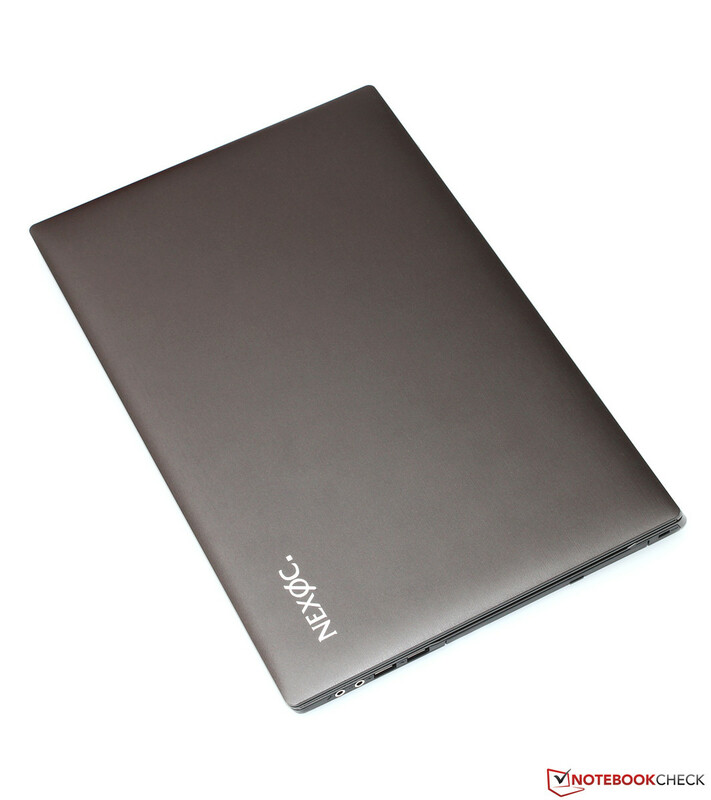 Nexoc offers a simple office notebook that is based on Clevo's W550SU barebone. The user can configure it individually, but choosing a quad-core CPU, a hybrid hard drive and an SSD quickly results in more than 1,000 Euros - a fair price for this level of performance? 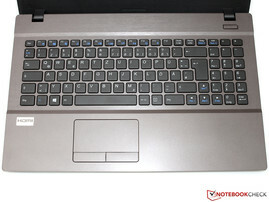 The device category that we call office notebook represents a wide variety of different models: Starting with the inexpensive entry-level device that is only used for text editing up to the high-end working machine with luxurious features, there are no limitations. 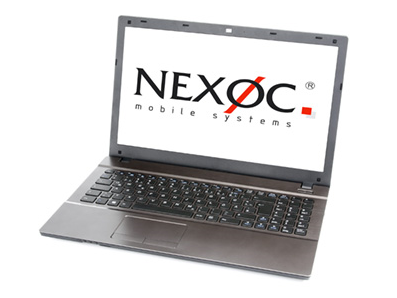 Nexoc, a German company that is specialized on individually configurable barebone notebooks, also offers several products in this office segment. 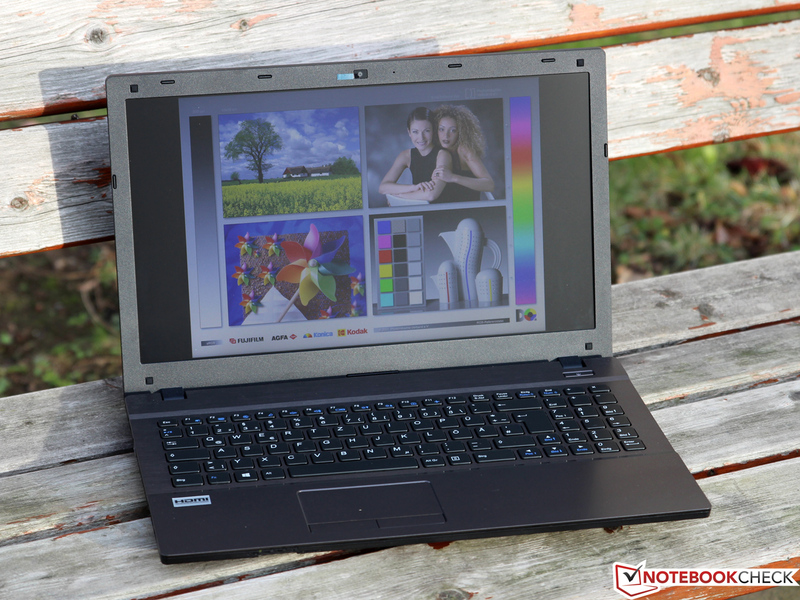 Today we have a look at the 15-inch B509II Ultra: The pretty meager basic configuration comes with a Pentium processor, 4 GB RAM and WXGA display. This business model - without operating system and hard drive - is available for less than 500 Euros. 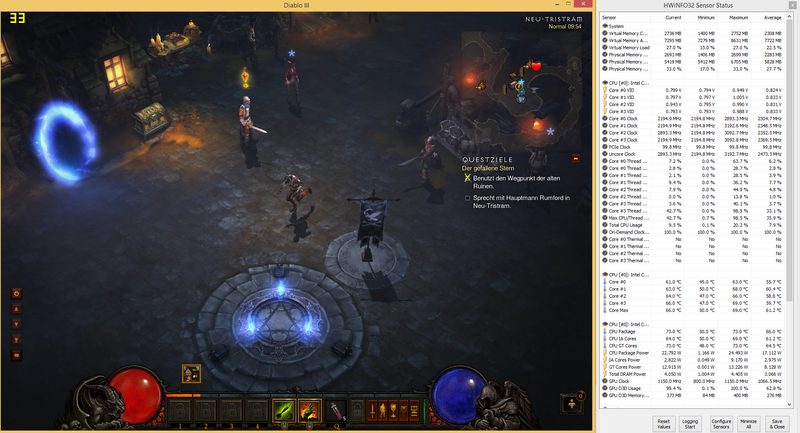 But you can also spend a lot more and upgrade the mentioned configuration with powerful components. 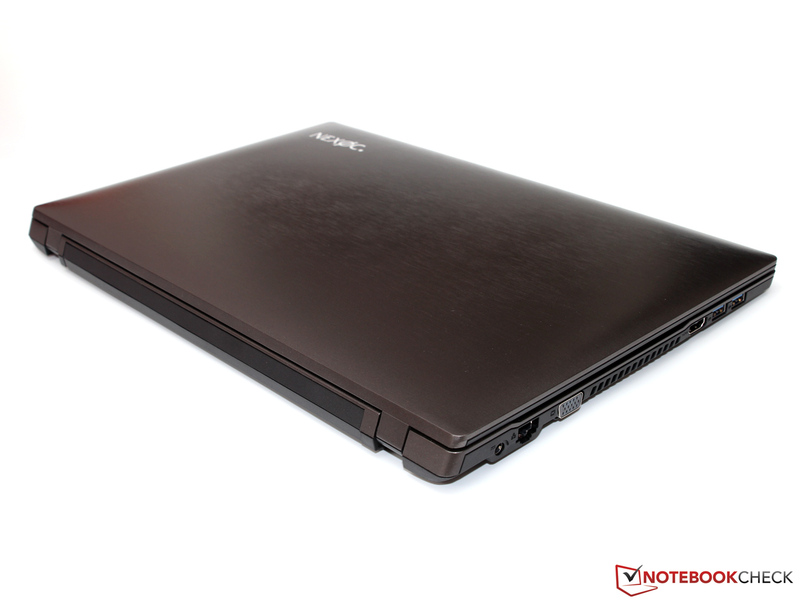 Our review unit for around 1,200 Euros uses a Haswell Core i7-4702MQ quad-core processor, 8 GB RAM as well as a generous HDD-SSD combination with a total capacity of 1,240 GB. The anti-reflective display now features the higher 1920x1080 resolution and Windows 8.1 is preloaded. Only a dedicated GPU is not a part of this top version. All this results in a pretty unusual system - most rivals with such a powerful processor always use an additional dedicated GPU from AMD or Nvidia. 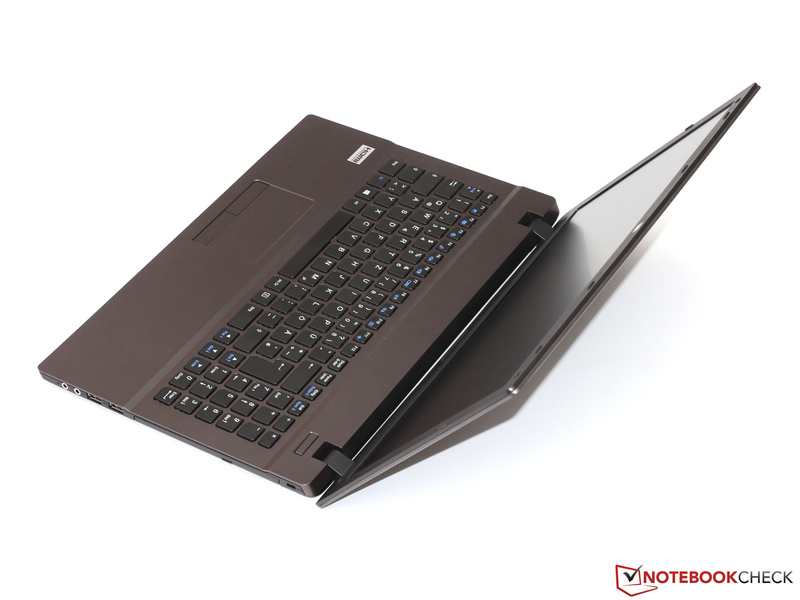 The two Schenker notebooks Xirios B502 and B513, which are also based on a configurable barebone, belong to the few exceptions. 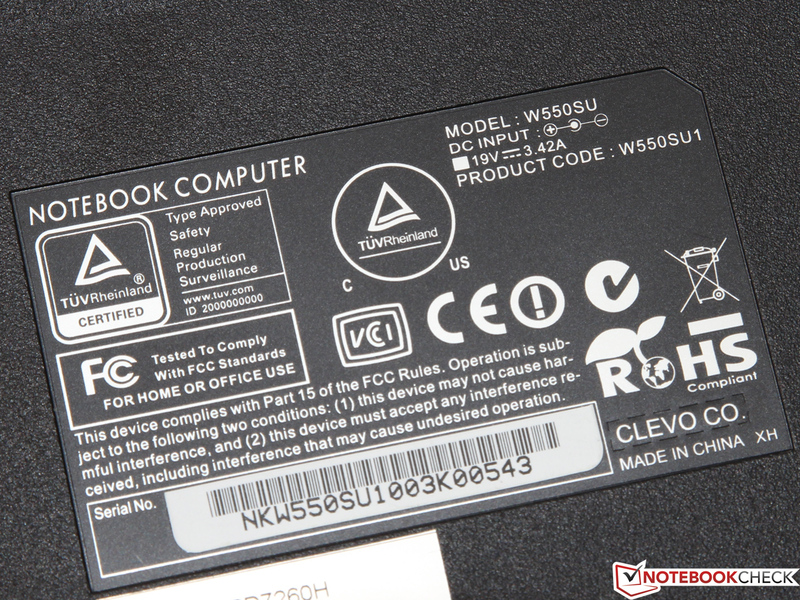 Nexoc's B509II Ultra notebook is actually a W550SU barebone from Clevo. This Chinese ODM also delivers cases to other manufacturers like Schenker, One or Deviltech (also see our barebone overview) and build up an impressive reputation, especially with their gaming desktop replacements. Many current Clevo barebones are however not perfect in terms of quality. 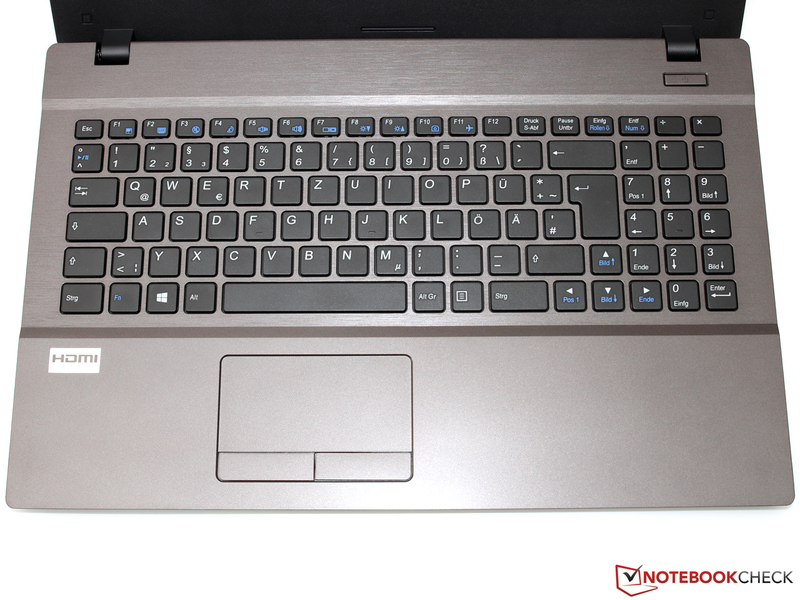 The W550SU follows this trend with its matte gray plastic surfaces, and neither the haptics nor the stability really meet the requirements of this price range. 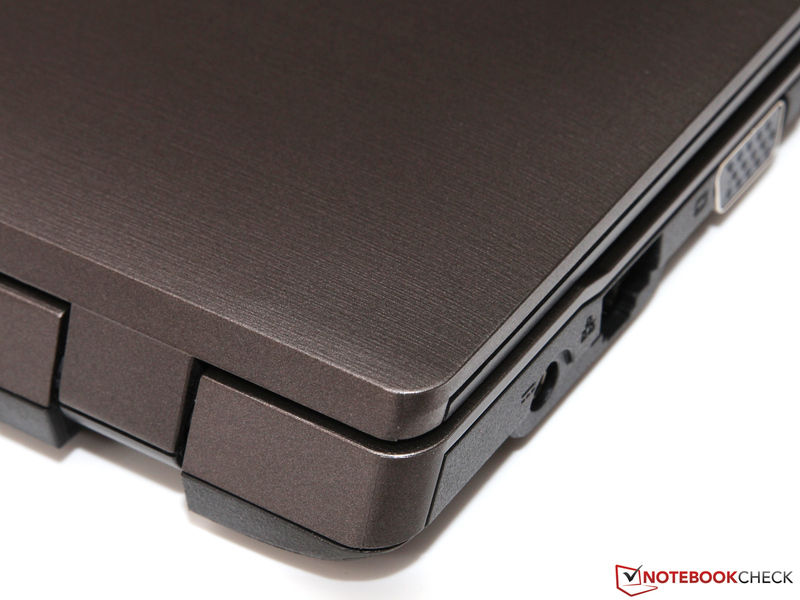 Especially the areas above the battery and around the keyboard are susceptible against pressure. The sturdy display leaves a better impression, but the strong hinges cannot avoid a slight bouncing. At least there are no creaking noises and the operation is not really affected by the mentioned drawbacks. In terms of build quality we can see some inconsistent gaps, but there aren't any serious issues. Still, the quality of the case is just average. There are no real surprises in regard to the connectivity. 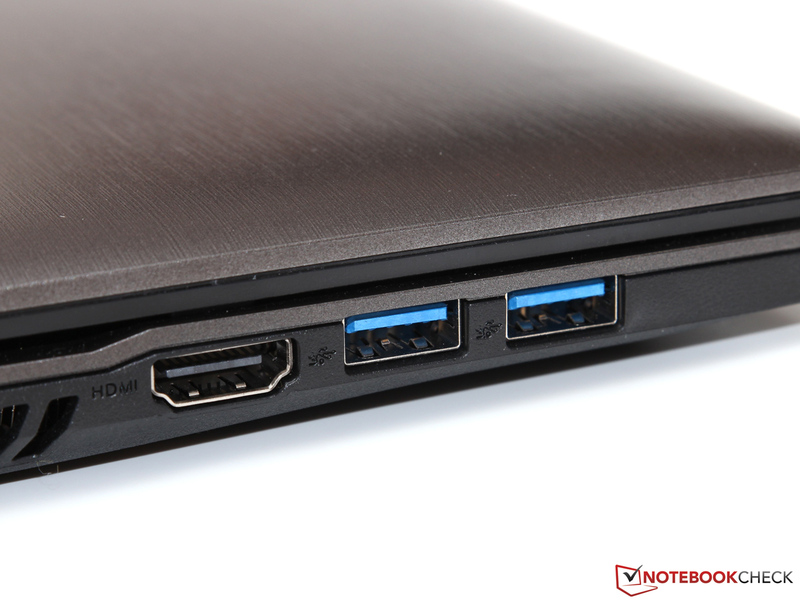 Four USB ports, two USB 2.0 and two USB 3.0, meet the standard equipment for this device category. The same applies for the two video ports VGA and HDMI - a DisplayPort, which is often required for high-resolution displays, is however not available. 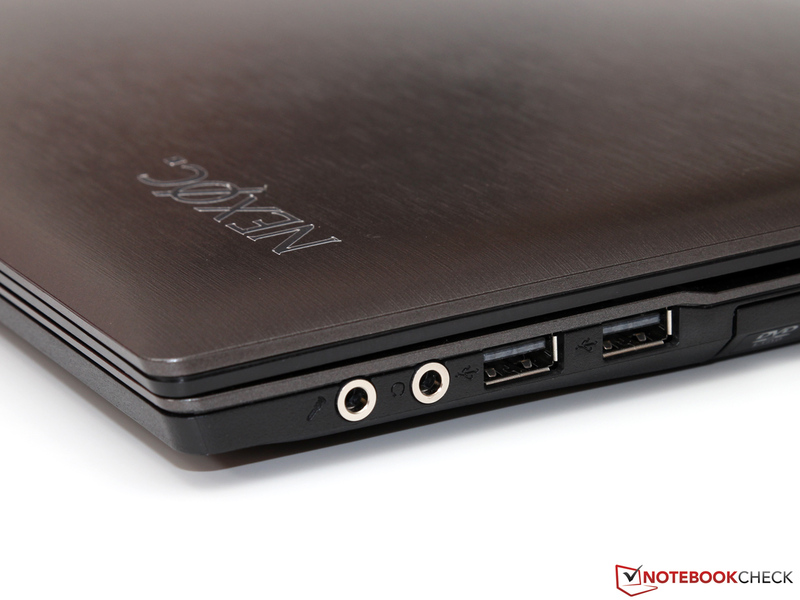 All the ports, including Gbit-LAN and the two stereo jacks, are located at both sides of the case. The layout is sophisticated, the only exception is the 9-in-1 card reader at the left front. 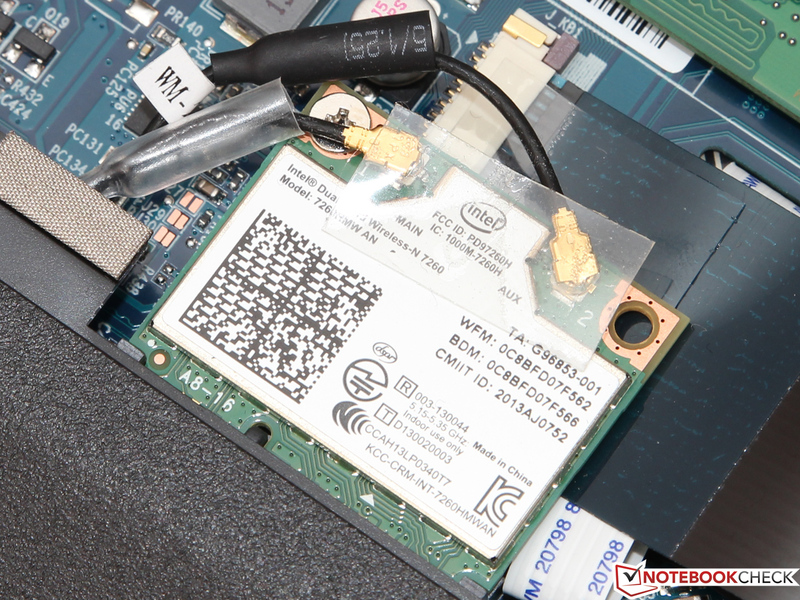 Nexoc offers two different wireless modules from Intel and our review unit is equipped with the Wireless-N 7260. The dual-band (2.4 and 5 GHz) and dual-stream capable adaptor supports the WLAN standards 802.11a/b/g/n and Bluetooth 4.0, but not the latest 802.11ac standard. The maximum transfer rate is accordingly up to 300 Mbps, but we can only see a third of that in practice under perfect conditions. We want to mention the excellent signal quality, we did not have problems with the connection even in tricky locations. An additional UMTS module from Huawei is available for a comparatively low additional charge of 72 Euros. 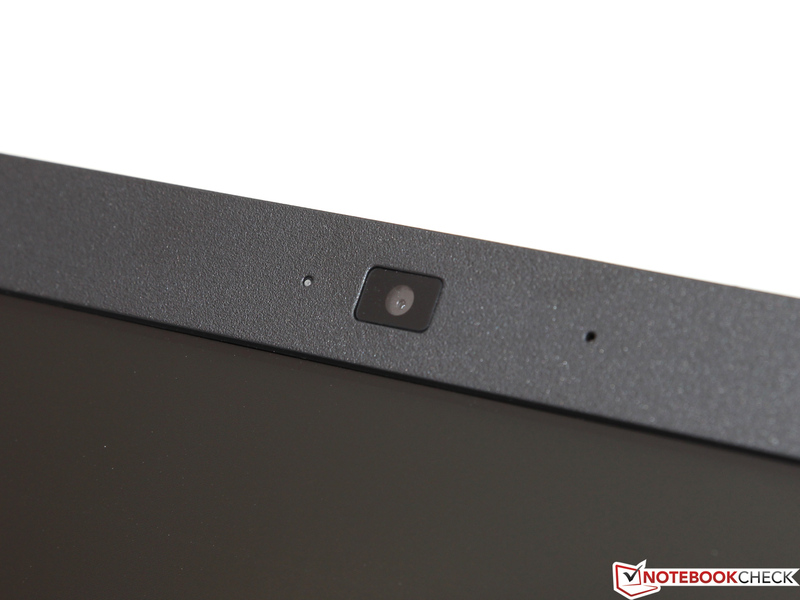 The integrated webcam has a comparatively high resolution of 2.0 megapixels. However, this theoretical advantage does not automatically result in better pictures: Details and picture noise are only acceptable when you are in bright environments. There is also a small but good microphone, which can replace an external headset for video chats. The provided accessories are limited to a power supply unit, several driver CDs as well as a trial version of Nero Essentials 12. Other additions in form of hardware or software are not in the box - but that is not really a problem. Compared to many larger manufacturers, who ship their systems with many preloaded stuff, this is a welcome change. 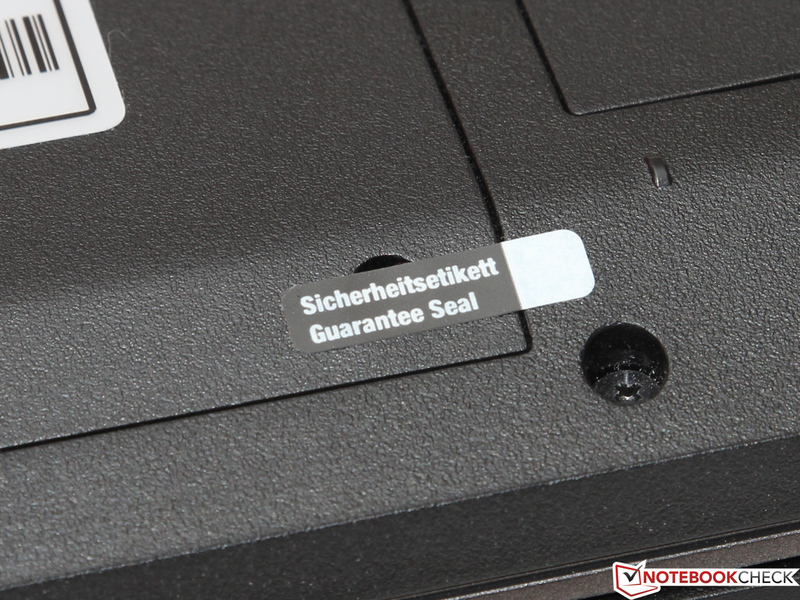 Even though the screws at the bottom are covered by a warranty seal, you can theoretically open the case and replace the components. 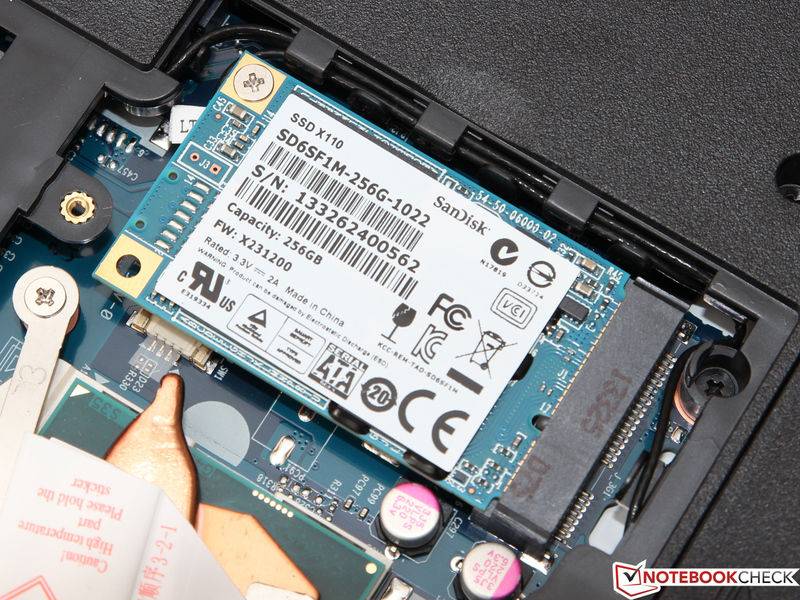 The barebone can accommodate one mSATA and one 2.5-inch drive, two memory slots as well as a WLAN adaptor. 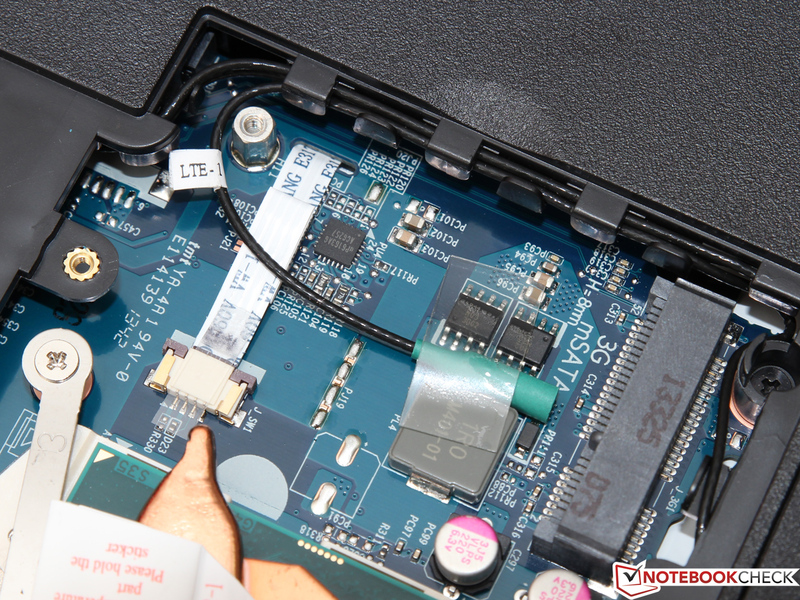 You can also upgrade the notebook with a WWAN module since all the necessary antennas are already integrated - but you cannot use an mSATA SSD anymore in this case. 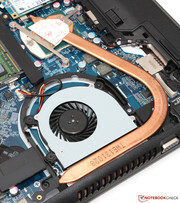 Other advantages are the socketed CPU and the easy cleaning of the fan and the cooling unit. 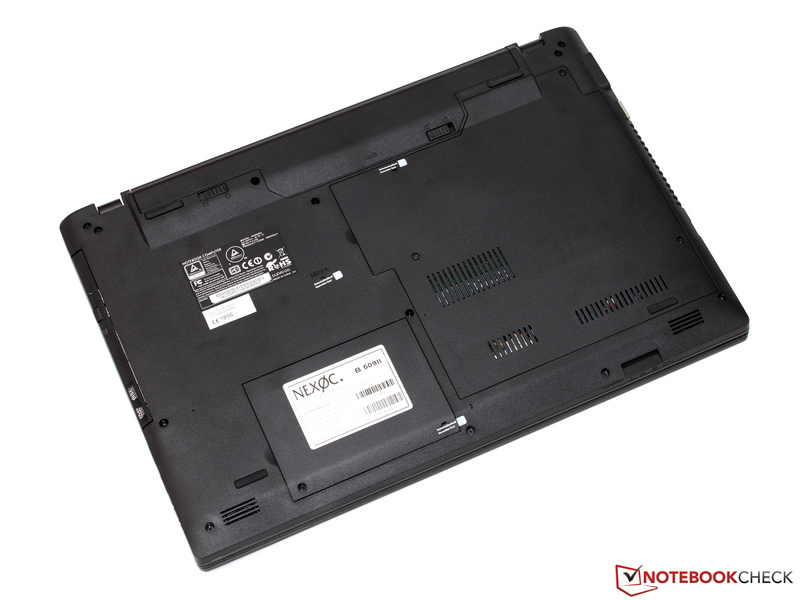 The notebook has a manufacturer's warranty of 24 months (Bring-In). Nexoc does not offer many service upgrades, but the additional costs are very reasonable: An extension to 36 months is available for 65 Euros, for example. Clevo avoids any experiments and uses the same keyboard layout for the W550SU that we already know from the W551EU (Schenker Xirios B502) and W840SU-T (Nexoc B401, without numeric keypad). 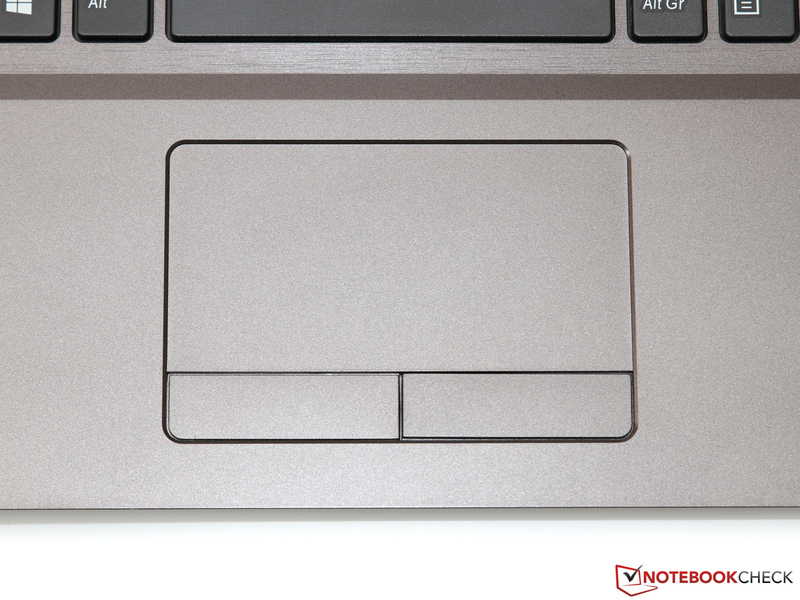 The 15 x 15 mm keys of the chiclet keyboard are seamlessly integrated into the surface of the base unit. 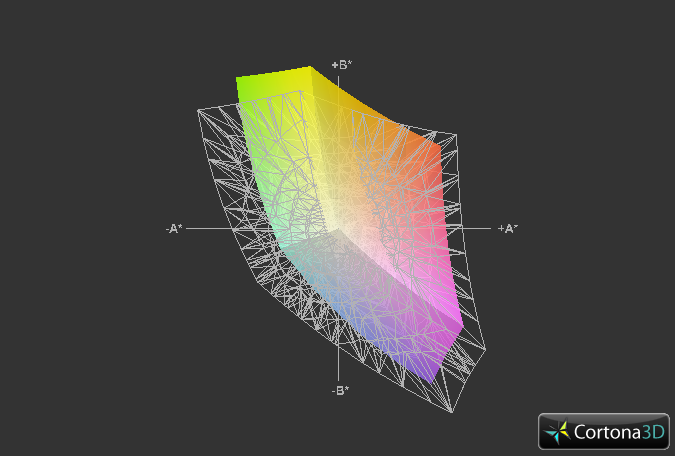 A background illumination is not integrated and it is not available as an optional extra, either. 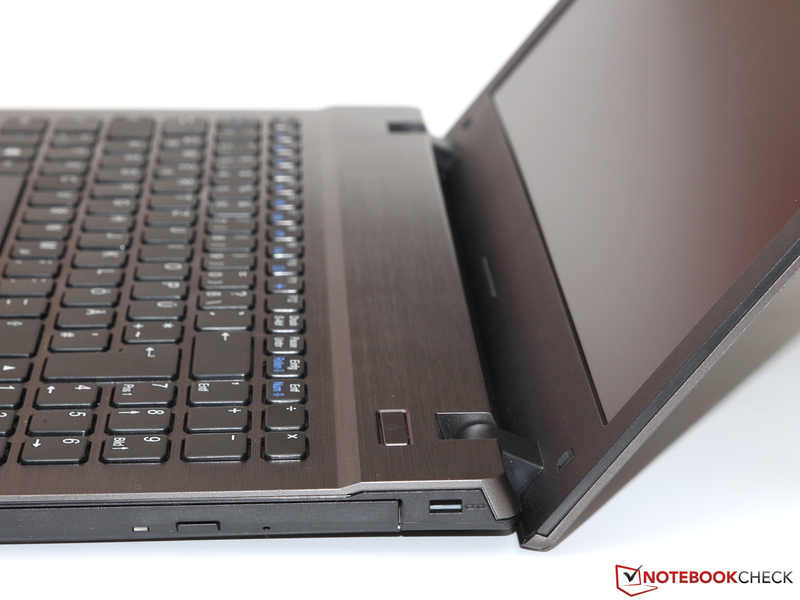 A well-defined typing experience is probably one of the most important features of a good office notebook - unfortunately, the Nexoc B509II disappoints in this section. Limited travel and a soft pressure point lack feedback, and the average case quality results in some bouncing at a few spots. You can still type pretty quickly and without typos with some practice, but you should not expect a ThinkPad or an EliteBook keyboard. 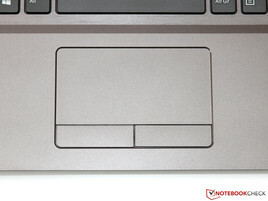 The 9.2 x 4.6 cm touchpad is provided by Synaptics and supports common multitouch gestures like pinch to zoom, turning or scrolling (but no inertial scrolling). It can be tricky to use the smooth touchpad surface with sweaty fingers, but it is otherwise very exact and executes inputs without delays. 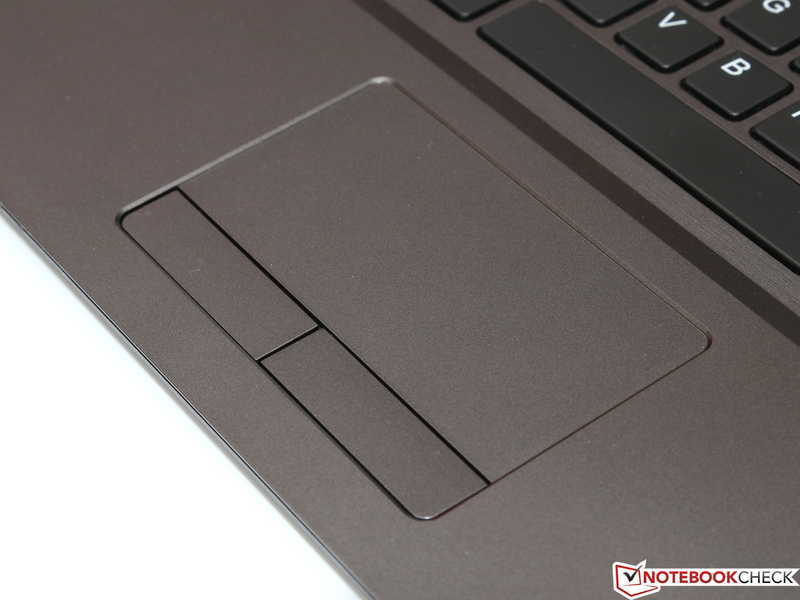 Contrary to the popular trend towards clickpads with integrated mouse buttons, the manufacturer decided to use dedicated buttons. The somewhat clattery stroke could be more precise for our taste, but it is still more than sufficient for a mouse replacement on the go. Nexoc replaces the standard WXGA display with a Full HD version for an additional charge of around 50 Euros. This results in a pixel density increase from 100 to 141 ppi, which does not only improve the sharpness of the picture but it also creates noticeably more working space on the desktop. We suggest you select the more expensive 1080p display if your are working with large Excel sheets or other complex applications. LEDs are used for the background illumination of the display and they are even sufficient for very bright environments. We can measure an average brightness of 344 cd/m² in the maximum setting, which is far above the usual standard. 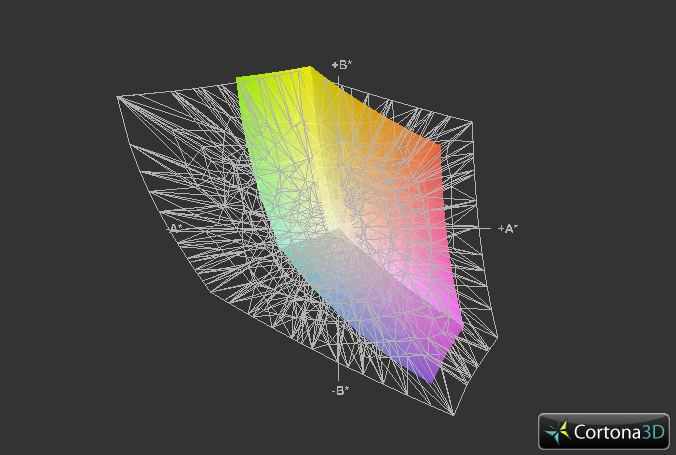 Only the Schenker Xirios B502 is even brighter with 374 cd/m². While the Clevo barebone W551EU from Schenker uses a high-quality IPS display, our review unit is only equipped with a common TN panel with the designation CMO N156HGE-LA1. Both the contrast ratio (344:1) and black value (1.04 cd/m²) are mediocre at best and result in a somewhat pale and not very vivid presentation. Other drawbacks are revealed by the color analysis, especially some shades of blue and cyan clearly miss their target values. The resulting average color deviation is very high with a DeltaE value of 10.8 and the grayscale presentation (DeltaE 12.4) cannot convince us, either. The panel is therefore not suited for professional picture or video editing. 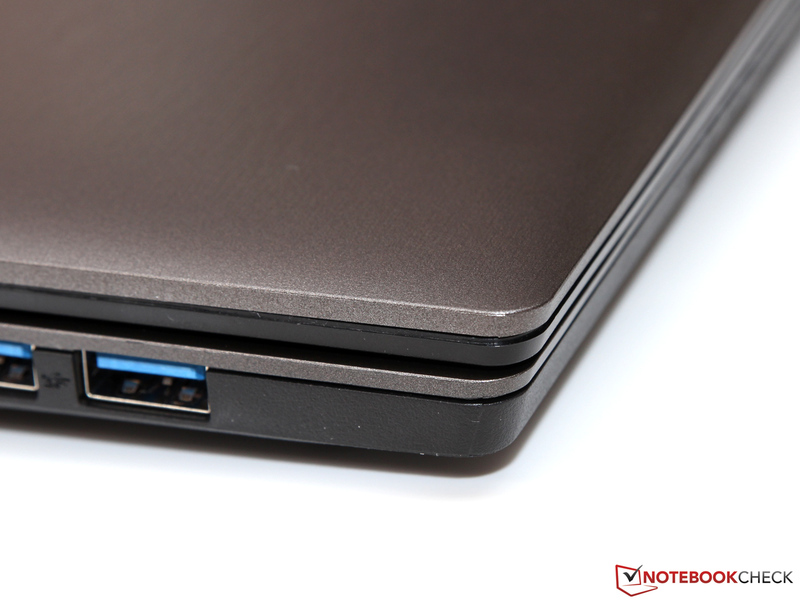 However, this is a common problem for many comparable notebooks and it is not very important for most everyday tasks. Both the WXGA as well as the Full HD display have an anti-reflective surface to avoid annoying reflections. We already mentioned the very good maximum brightness of more than 300 cd/m² (brightness of the WXGA display is unknown). 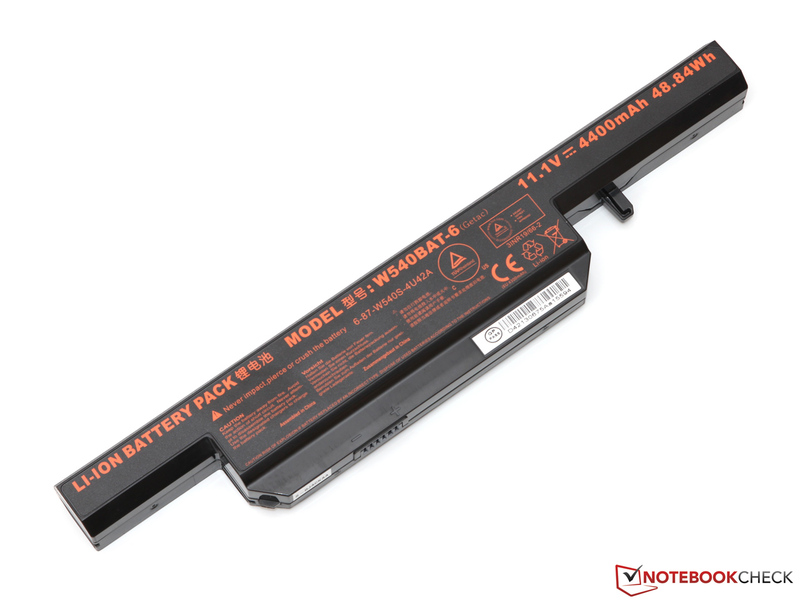 Thanks to the combination of these two attributes you can even use the notebook under direct sunlight - most of the time even with reduced brightness to improve the battery runtime. Less convincing are the possible viewing angles. It is a common problem with TN panels and you should not really deviate from the perfect viewing position in the center. 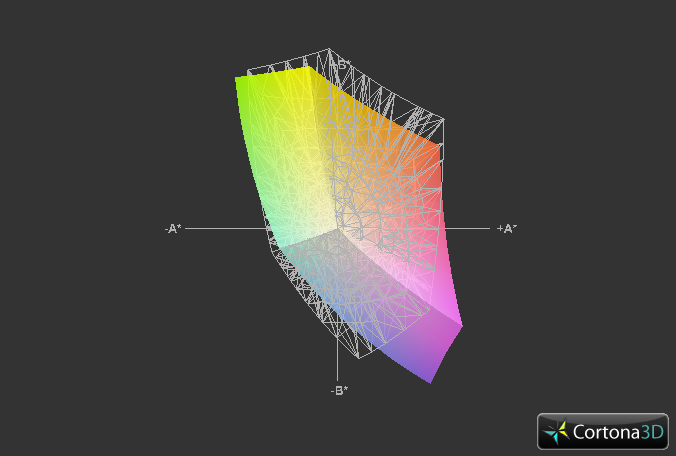 Vertical changes quickly result in a loss of contrast and color intensity. The situation is better with horizontal angles, but an IPS display, for instance in the Xirios B502, is superior in this category. 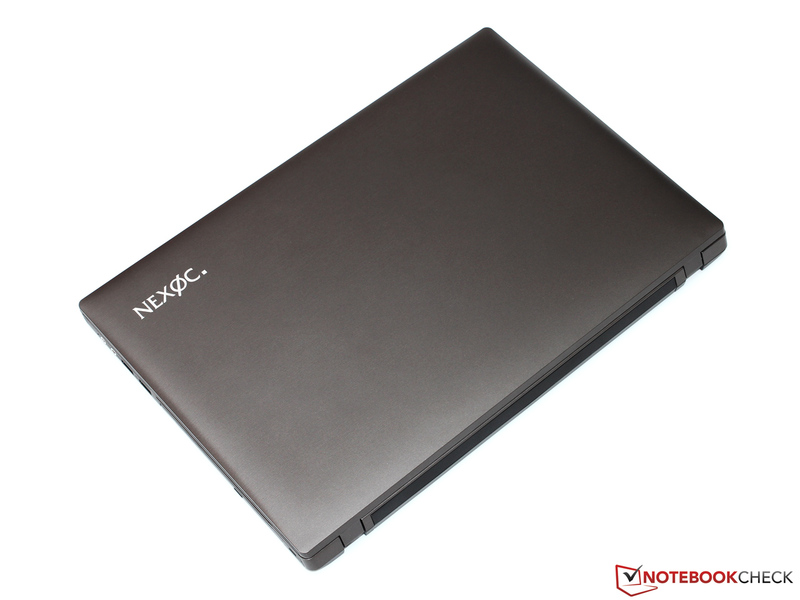 While the competition uses more and more frugal ULV processors in large 15-inch devices, Nexoc equips its office notebook with a typical standard voltage CPU and a TDP of 37 Watts. 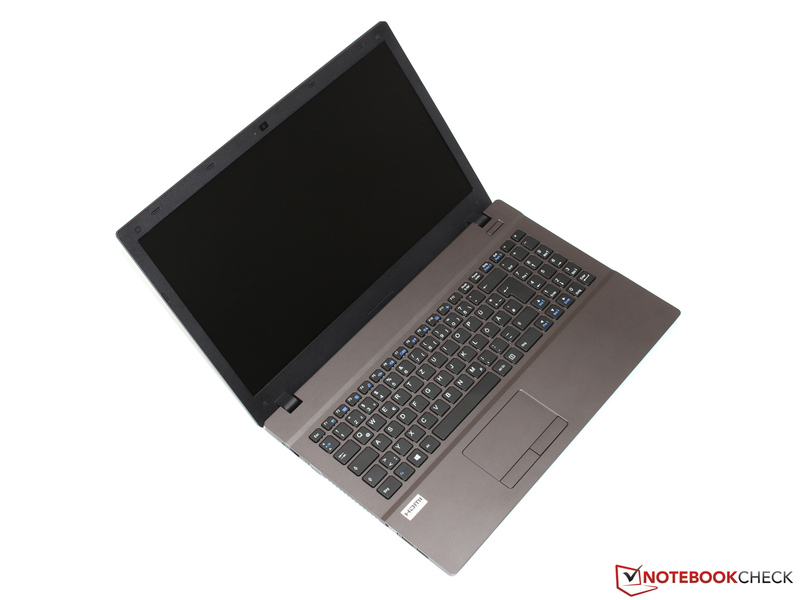 The B509II Ultra can be configured with several CPUs, starting with dual-core versions like the Core i5-4200M or even the significantly more powerful Core i7-4702MQ quad-core. 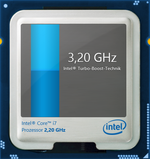 The latter has a clock of 2.2 up to 3.2 GHz depending on the load and supports Hyperthreading to execute eight threads simultaneously. 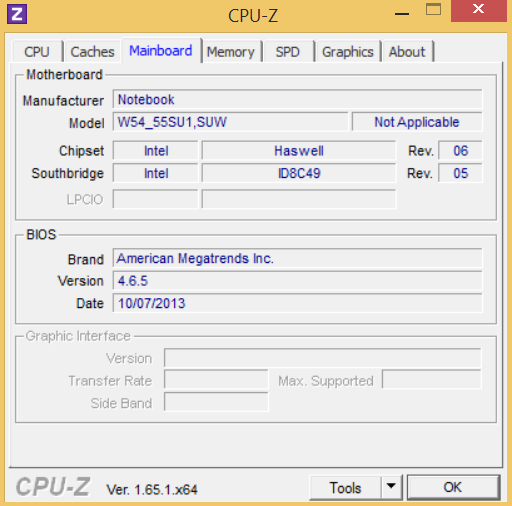 More information can be found in our CPU database as well as the special article about the Haswell architecture. 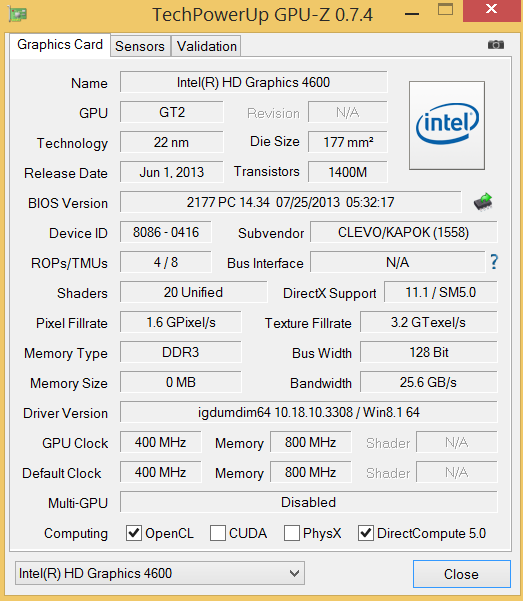 There is no dedicated GPU, so the graphics have to be handled by the integrated Intel HD Graphics 4600. It has 20 Execution Units (EUs) and represents the medium-spec version (GT2) of the Haswell GPU with a clock of 450 - 1,150 MHz - the performance is sufficient to compete with some older mainstream GPUs like the Radeon HD 7670M. The money that you saved for the GPU was used for the storage and memory equipment in return. You not only get 8 GB RAM with two 4 GB modules in a dual-channel configuration, but also a 1,000 GB hybrid hard drive and a 240 GB SSD. ...as well as multi thread scenarios. 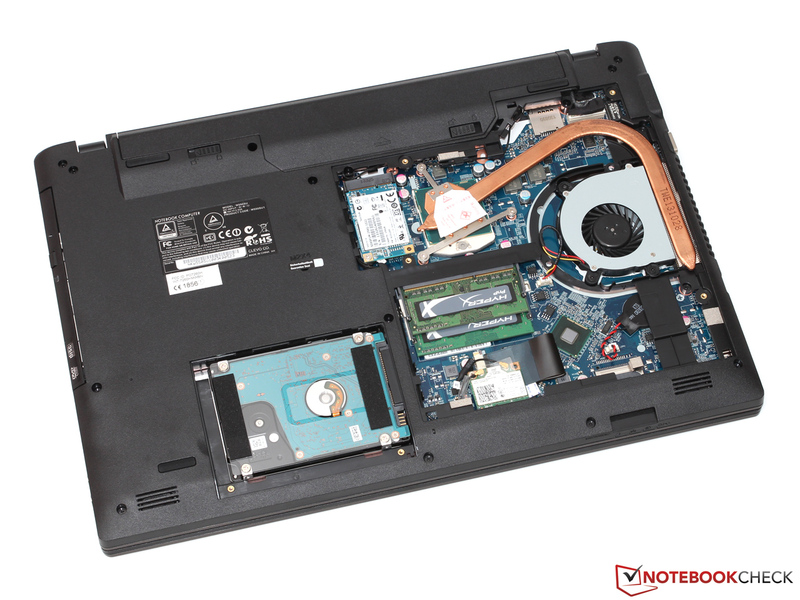 It is not the first time that we review the Core i7-4702MQ, we already know the performance from many other notebooks like the Acer Aspire V3-772G. 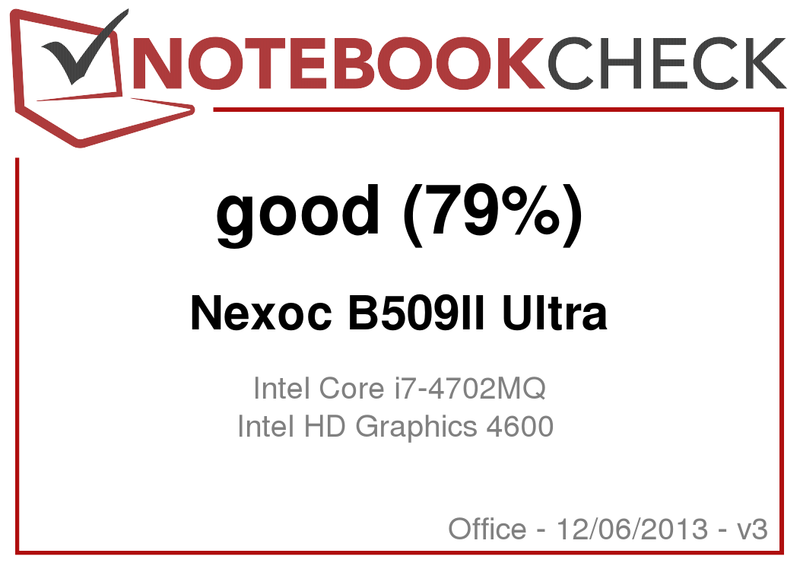 A direct comparison shows that the CPU inside the Nexoc B509II Ultra is roughly 10 percent behind its theoretical performance in multi-thread benchmarks. 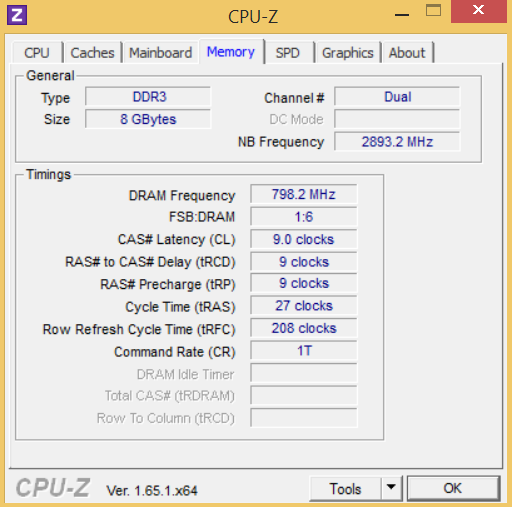 We can quickly determine the issue: Instead of 2.9 GHZ, the CPU only runs with 2.6 GHz. This is a drawback, but you will hardly notice it in practice. 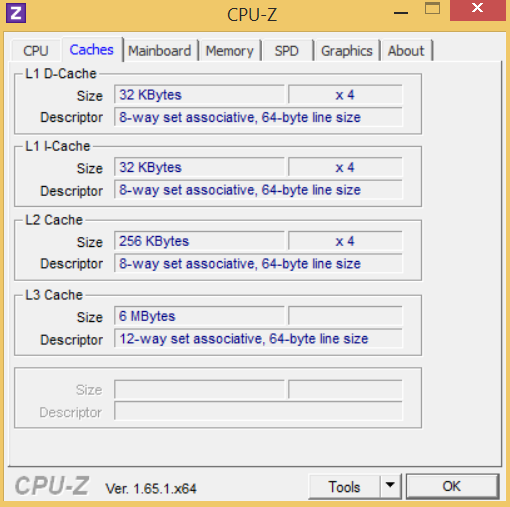 There is no problem in single-thread scenarios; the CPU can use its full Turbo Boost potential (3.2 GHz). A bigger problem is the radical throttling on battery power, where the Core i7 only runs with meager 1.4 GHz and it does not matter which energy profile or application you use. This should still be sufficient for most applications, but we do not like this - especially often with quad-core CPUs - paternalism of the user. 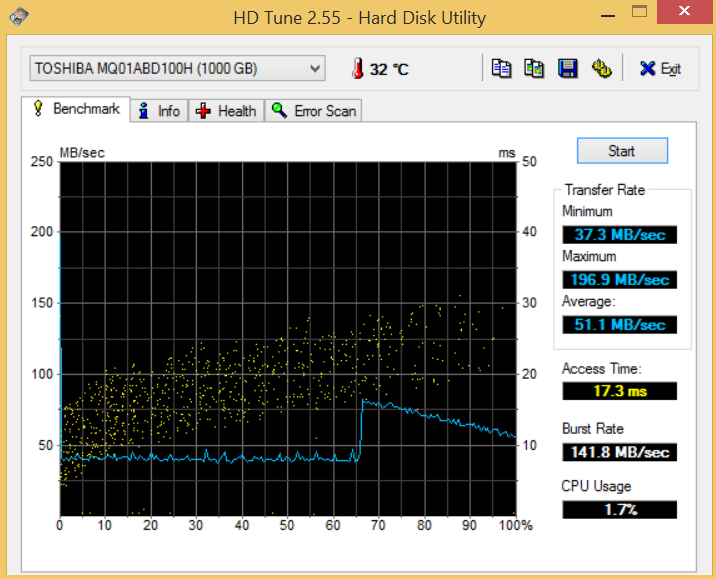 Hardly any component has such a big effect on the subjective system performance as the storage drive. This is also the reason that our review unit uses an SSD with a generous capacity of 240 GB, which should be more than enough for the operating system and the most important applications. The SanDisk X110 uses 19 nm MLC flash and the Marvell controller SS889175. 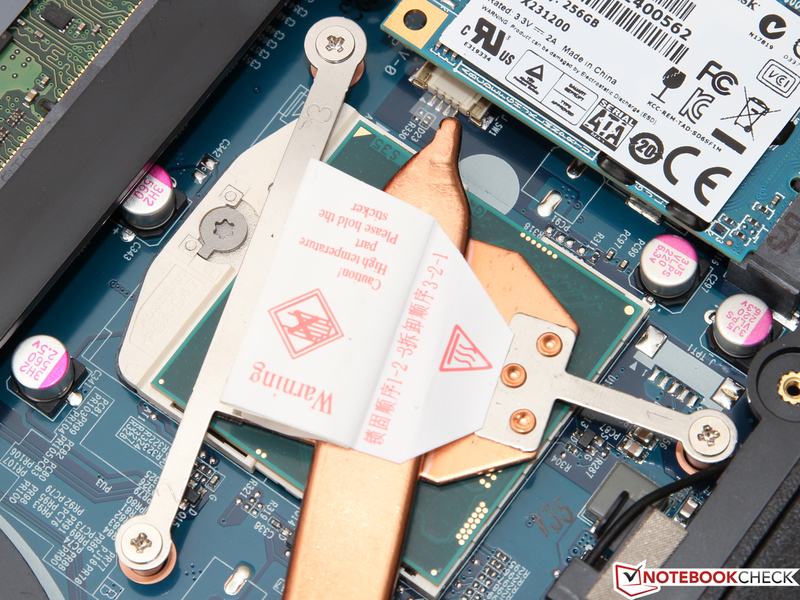 The resulting performance is excellent: Sequential transfer rates between 400 and 500 MB/s almost hit the limit of the current SATA standard. 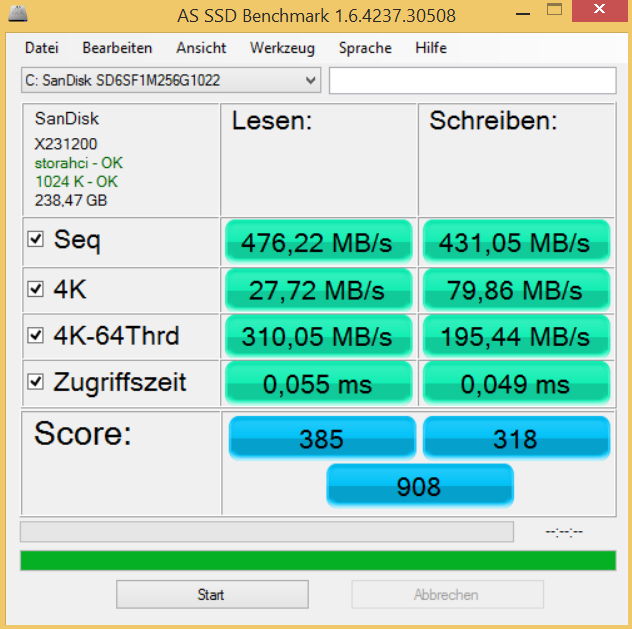 The more important 4K results are also very good and on one level with a Samsung SSD 840 Evo. 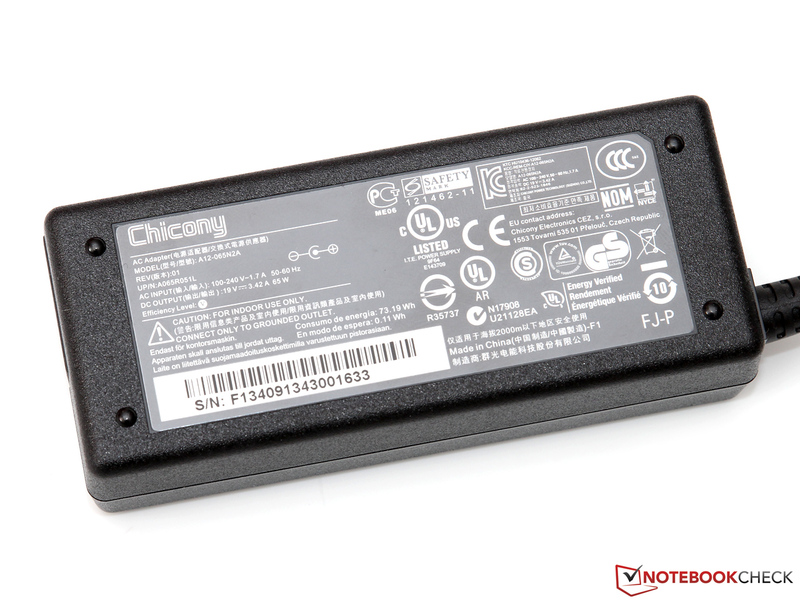 The manufacturer also integrated a so called hybrid hard drive from Toshiba (MQ01ABD100H) for additional storage. This hybrid drive consists of a typical 1,000 GB mechanical hard drive and 8 GB additional flash storage, which is used as buffer storage for frequently used data. It is very hard to measure the advantages of this concept with synthetic benchmarks, but such an SSHD can result in significantly lower access times and therefore faster application starts. 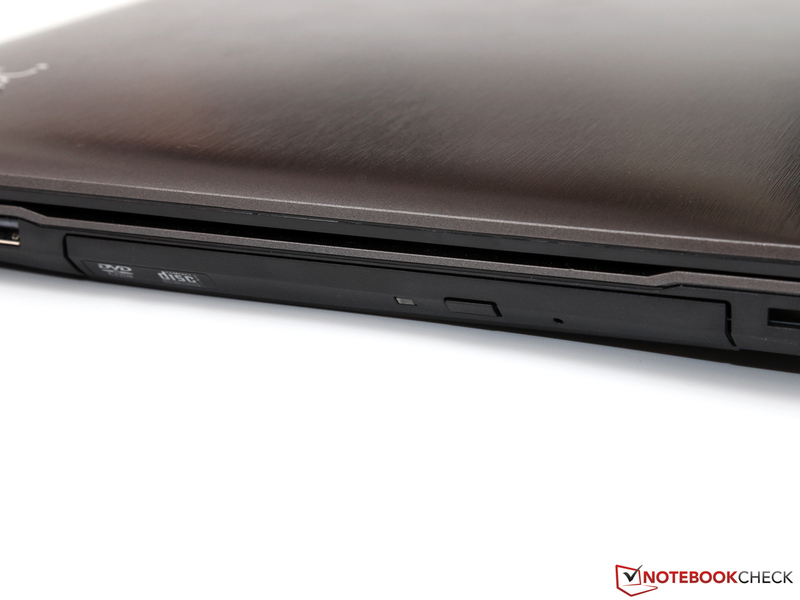 The combination of a quad-core processor and an SSD inside the B509II Ultra results in the highest PCMark 7 scores for any office notebook we reviewed so far. 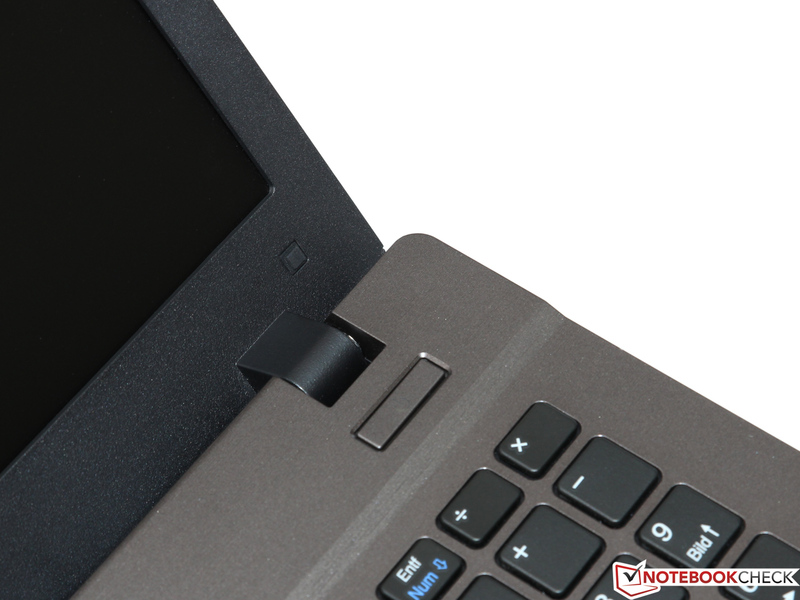 Neither the Schenker Xirios B502 nor Dell's Latitude E6540 can keep up with the 5,745 points of the Nexoc, even though the differences are mainly a result of the fast SSD. This impressive system performance is also perceptible in practice. 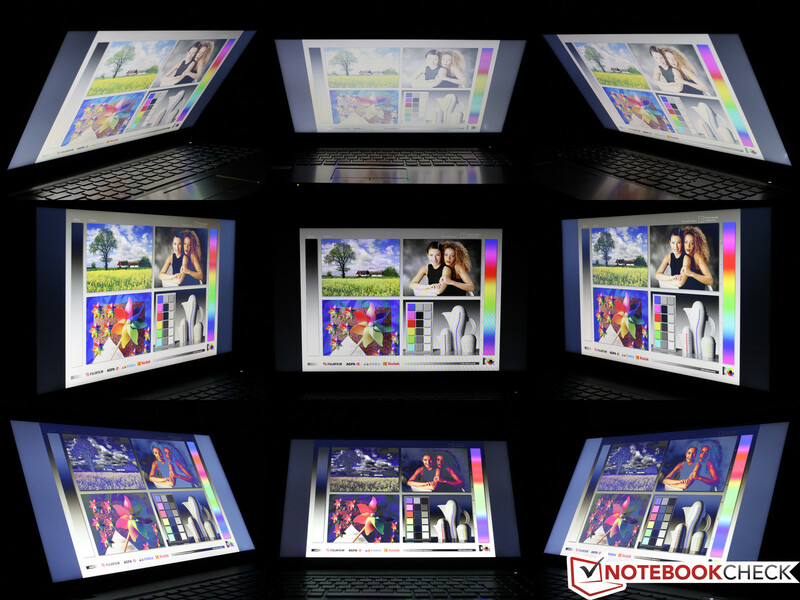 Even complex Excel calculations, video transcoding or multi-tasking are not a big challenge for the notebook. Our top configuration is far too good for simple text editing - the 200 Euros less expensive Pentium 3550M and less memory would be sufficient for that. Intel's graphics processors are still not known for excellent performance or high-quality drivers, but the situation has improved over the last couple of years. The GPUs can actually compete with current AMD APUs, and graphical errors or similar issues are not a big problem anymore. Some features like the blazing fast Quick-Sync encoder are even unique features. 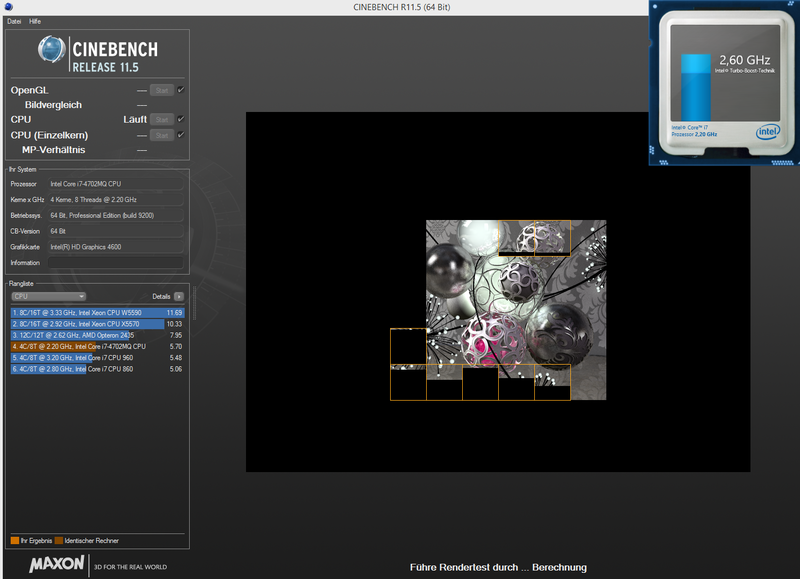 Thanks to the dual-channel memory configuration, the HD Graphics 4600 can use its maximum potential and gets a 3DMark 11 score of 1,249 points. This is roughly on one level with a dedicated Nvidia GeForce GT 720M and is sufficient for smaller CAD projects, for instance. Gaming is not the main purpose of the B509II Ultra, but many titles run surprisingly well with some limitations in terms of resolution and level of detail. Most of our tested games, even though they are not the most demanding in regard to the GPU, were playable with at least 30 fps in 1366x768 and with medium details. Even current blockbuster action titles like Battlefield 4 can be played with the HD Graphics 4600, but it requires at least a GeForce GT 750M or more for nice graphics. 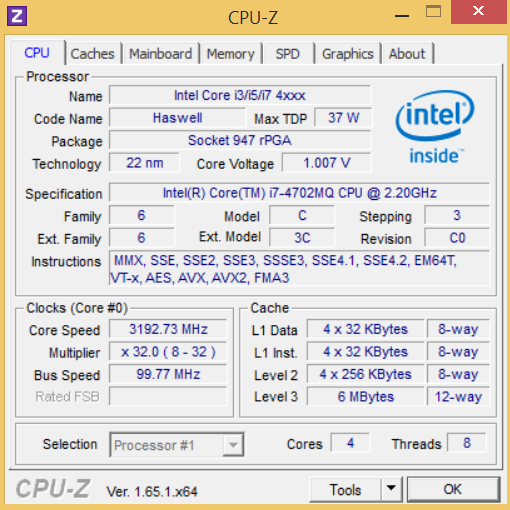 Despite the powerful i7 processor, the fan is not spinning very often during idle. The B509II Ultra can usually be cooled passively, so the slight noise of the hard drive is the only distraction - perfect conditions for concentrated working. This does however change as soon as an application uses the full performance of the system. We measured 49.1 up to 50.1 dB(A). This is not only significantly louder than the Xirios B502 (45,9 dB(A)), but also a real burden on your ears. The temperature development on the other hand is moderate. The case does not get inconveniently warm, neither during idle nor under load. Only exception is the small hotspot in the area around the fan exhaust. Using the notebook on your lap is therefore no problem. 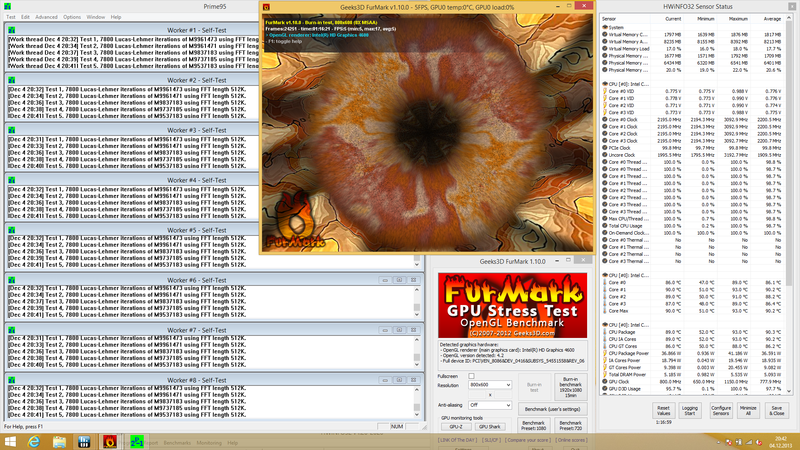 We measured a CPU core temperature of around 90 degrees Celsius after our stress test (Prime95 and Furmark simultaneously for at least one hour). This is still reasonable - real applications are not going to stress the chip like our stress test. 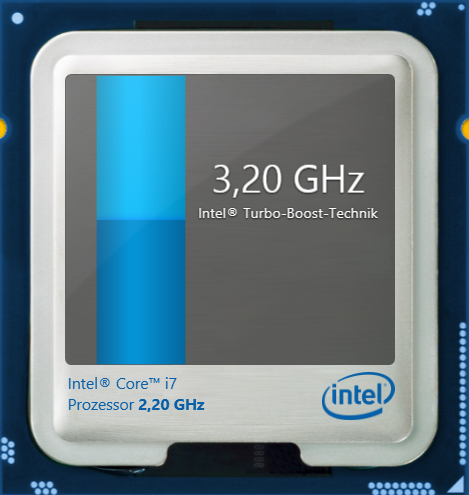 Due to its comparatively low TDP, the Core i7-4702MQ has to reduce its CPU and GPU clock to 2,200 and 800 MHz, respectively, but it does not drop below the nominal clocks (no throttling). Two stereo speakers are located at the front. They are sufficiently loud and there are no distortions, but bass is not very powerful during music or movie playback. 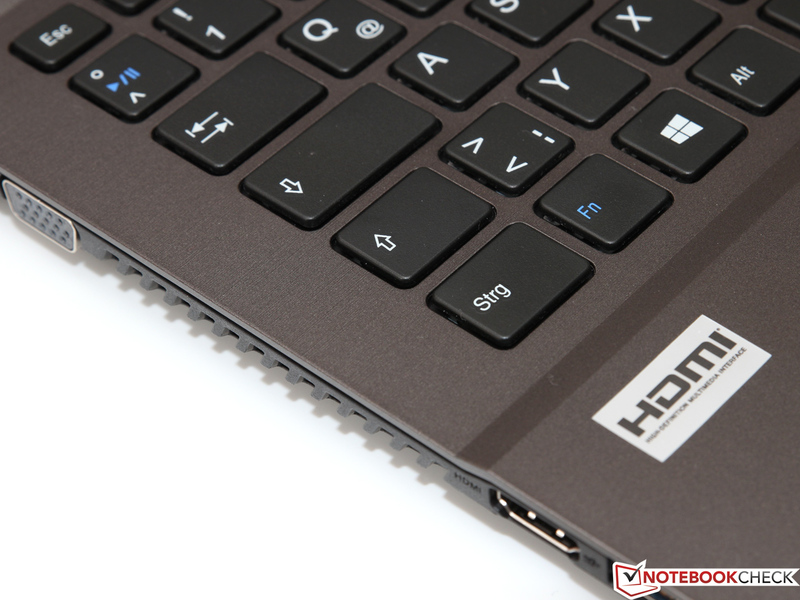 This might not be very important for an office notebook - the user can also attach an external sound system via stereo jack or HDMI. 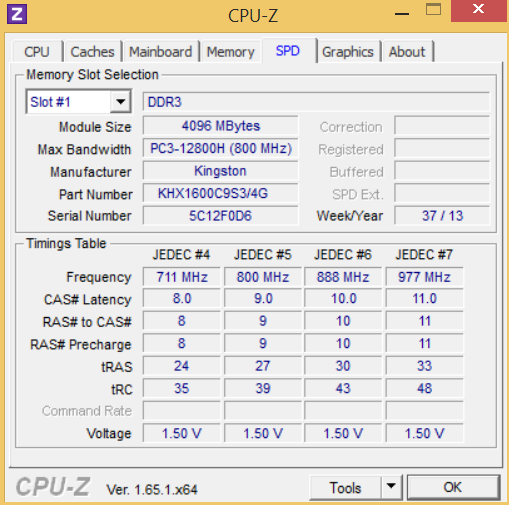 The B509II Ultra consumes between 11.5 and 18.8 Watts during idle, which is typical for this hardware equipment. 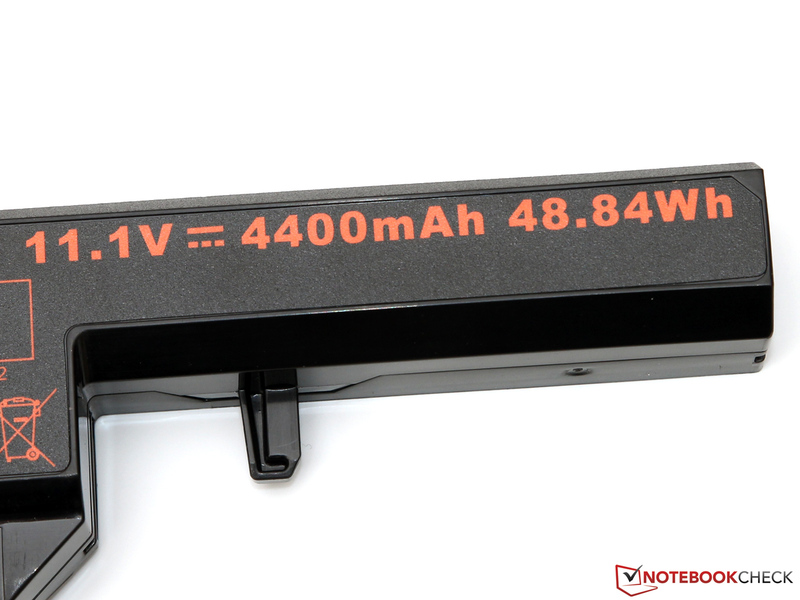 The manufacturer should however improve the consumption during stand-by, 2.6 Watts are definitely too much - a result below 1 Watt would be appropriate for a modern notebook. 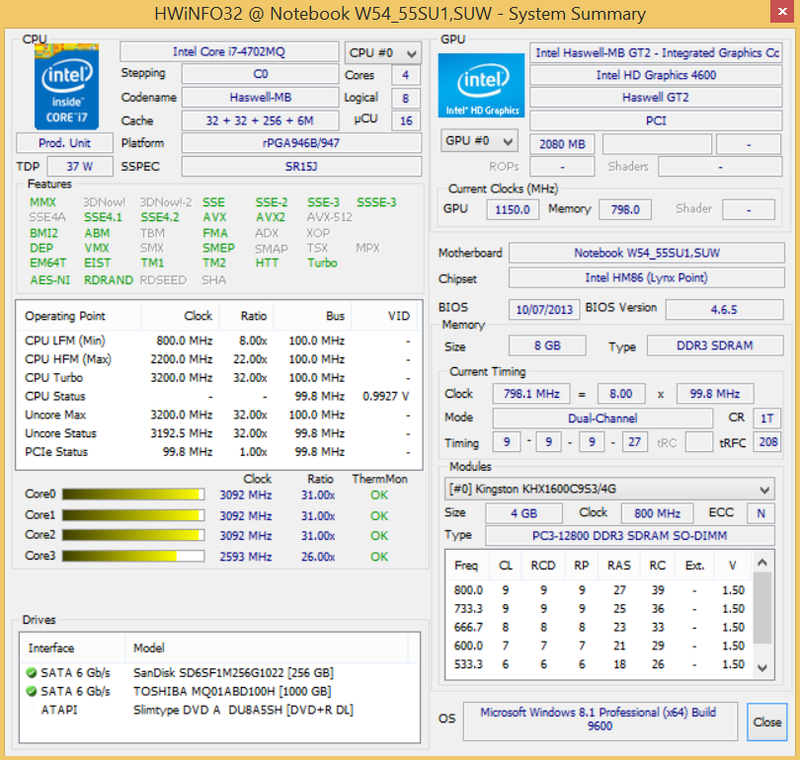 We can see the influence of the fast quad-core CPU under load with 56 up to 61.1 Watts. 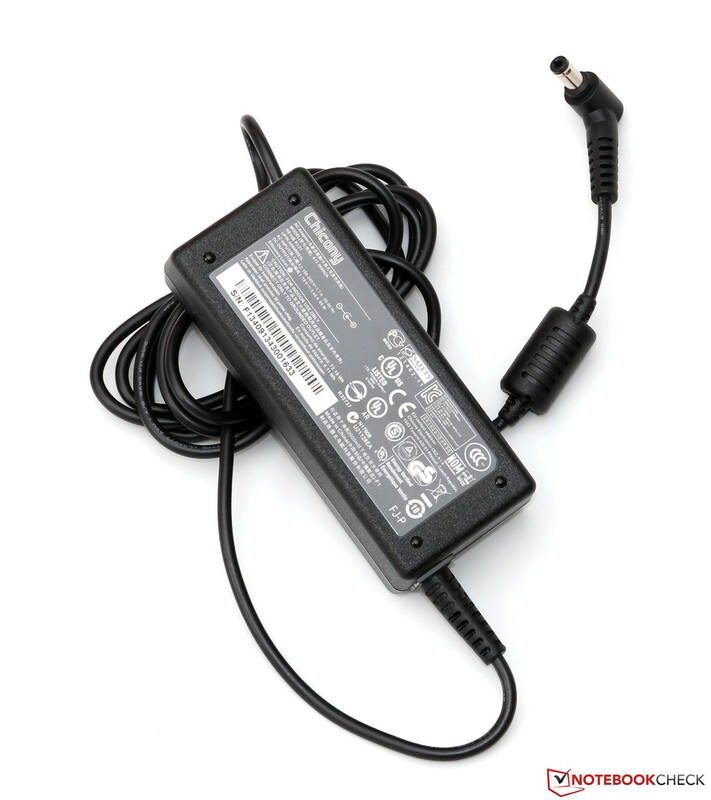 The provided 65 Watts power supply unit does not leave much headroom and there are not many reserves if you want to charge the battery at the same time. We do not expect long battery runtimes because of the mentioned consumption values and the comparatively small 48 Wh battery. The Battery Eater Reader's Test (energy-saving mode, minimum display brightness, WLAN deactivated) only determines a runtime of 5 hours and 34 minutes, even though this test more or less represents the idle operation. 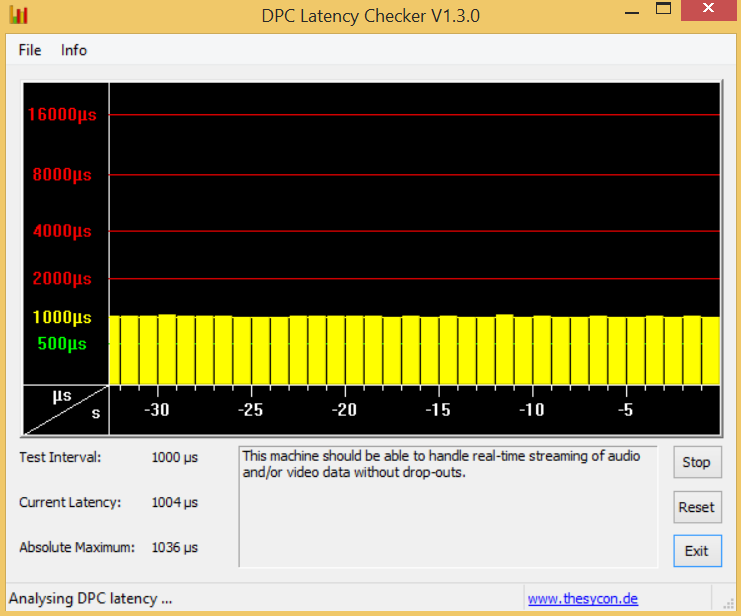 Users should expect around three and a half hours in practice, which can be seen in our browsing test with activated WLAN and adjusted display brightness (around 150 cd/m²). 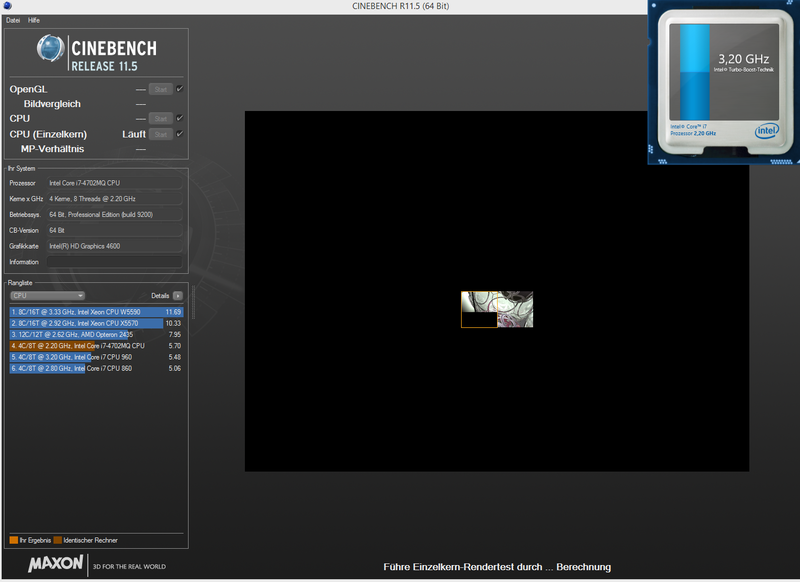 We expect similar runtimes for the playback of local HD video files. Thanks to the already mentioned throttling of the CPU, the B509II Ultra actually manages 1 hour and 26 minutes in the Battery Eater Classic Test (high-performance energy profile, maximum display brightness and activated WLAN) before the battery is empty. A complete recharge only takes about 2 hours. 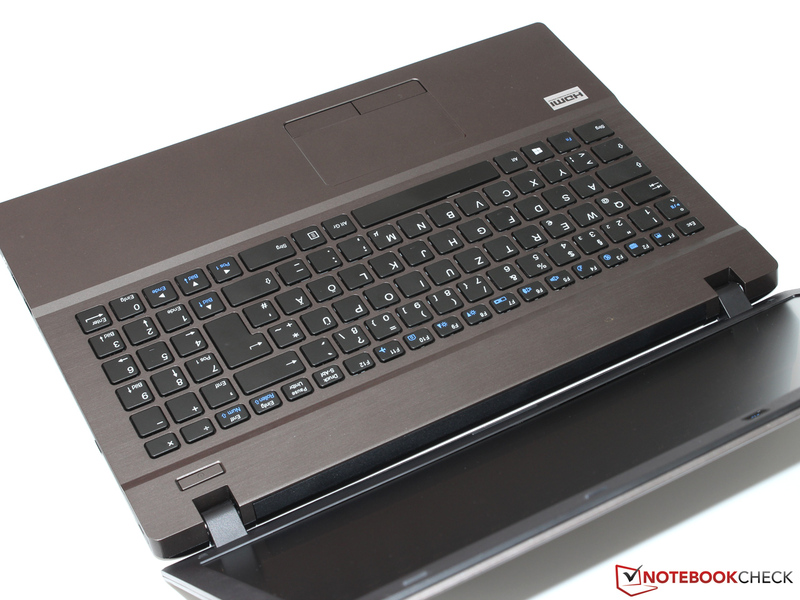 It is actually quite a tough task to create a really good business or office notebook - this is also evident when you look at the prices for a high-quality Lenovo ThinkPad, Dell Latitude or HP EliteBook. Compared to that, the 1,200 Euros of the really well-equipped Nexoc B509II Ultra are almost a bargain. It does however not take very long before you see that the potential buyer will have to live with some sacrifices: Missing security features and the mediocre case as well as input devices are the result. 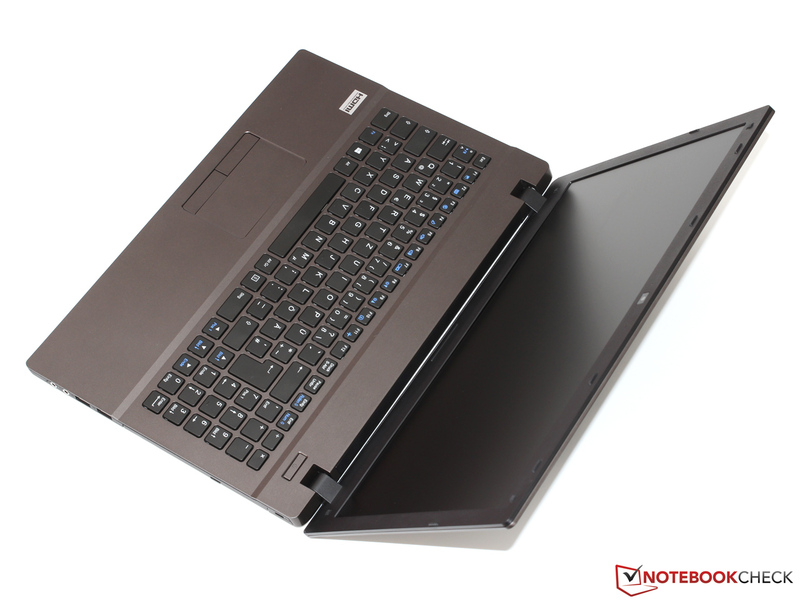 Other drawbacks are the TN panel with poor viewing angle stability and the system noise under maximum load. The only solution for the latter problem is probably a slower and more frugal processor. 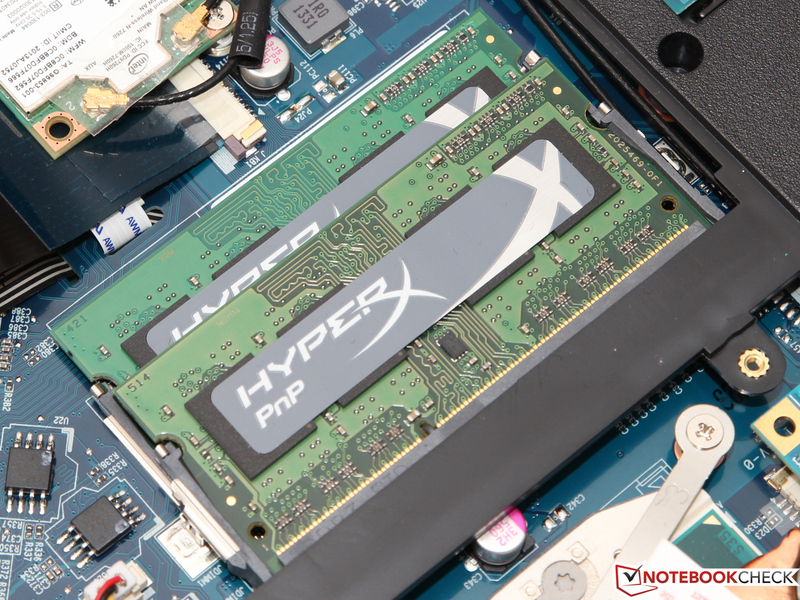 This configurability is a big advantage of the B509II: You want additional memory? Need more storage? Or you want an UMTS module? No problem - and the buyer just pays for the selected components. You might even find a suitable configuration at a local dealer with some luck, and you might even get an additional discount. All in all the device leaves a mixed overall impression - especially the drawbacks are serious for an office notebook. Is this compensated by the mentioned advantages? That basically only depends on your requirements. ...but the design is certainly simple and functional. ...but is based on a Clevo barebone. ...but the whole case is actually made of simple plastic. Stability and quality are just average. ...as well as Gbit-LAN and VGA. The mouse buttons could be more precise as well. Poor results of the webcam despite the resolution of 2 megapixels. ...accommodates the 48 Wh battery. You can expect around 3 to 4 hours of web browsing. ...to remove the maintenance cover. The latter can also be replaced with a WWAN module. ...is just sufficient for the consumption of the notebook. 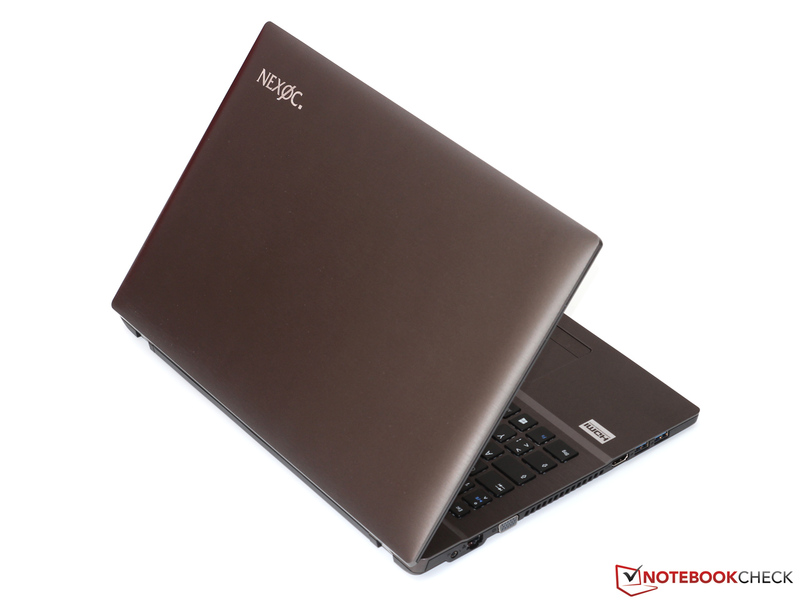 The free choice of processor, memory, hard drive and other components makes the Nexoc B509II very attractive for everybody who wants a personalized notebook. Another advantage: Excellent maintainability, but you have to keep the warranty restrictions in mind. It is unfortunate that the high-resolution display is a TN panel with limited viewing angles. There is currently no high-quality IPS panel in the online store. Even though there is no dedicated GPU, the notebook actually manages smooth frame rates for most 3D applications and even current games. Only high resolutions and high quality settings are usually too demanding for the HD Graphics 4600. Similar concepts are also offered by Schenker with the Xirios B502 and B513. 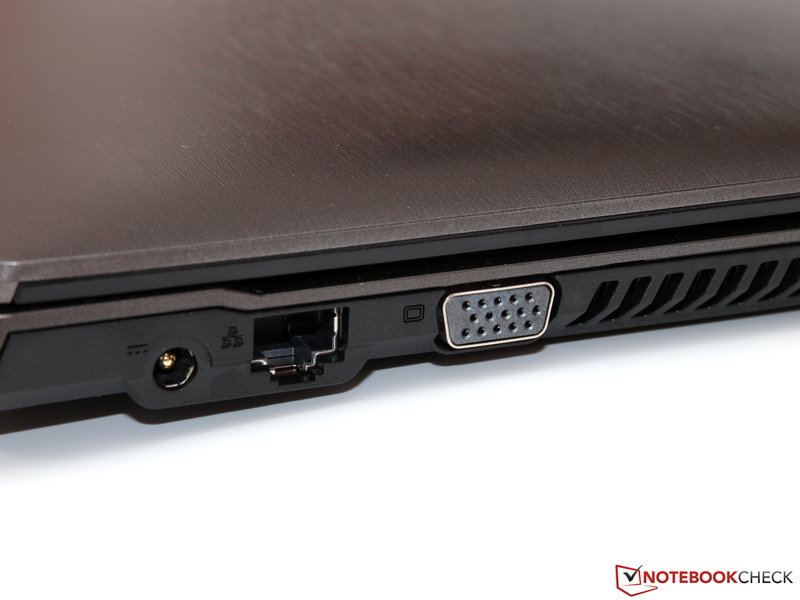 Other alternatives are the Lenovo ThinkPad T530, HP ProBook 450, Fujitsu Lifebook E782 or Dell Latitude E6540.